Most draft followers have yet to hear of Deji Karim. 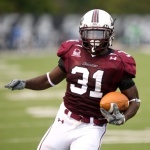 The Southern Illinois back scored 20 touchdowns this past season, averaging 7.1 yards per carry for the Salukis. His 2009 efforts earned him AP All-American honors at the FCS level and an appearance in the Texas vs. The Nation Game. Let’s start talking about being very successful at a lesser-known school. You did really well at Southern Illinois, yet you’re still getting overlooked to some extent. How do you feel about that, and how are you battling that? Well, first and foremost, I’ve got to thank God for allowing me to go through the process I did. You know, at the same time, I’ve been overlooked all the way up to this. I mean, it’s nothing but another challenge thrown my way, and I’m going to do everything I can at keeping at this once again. But I’ve always been overlooked, since I’ve been in high school. You’ve always been overlooked? Why is that? The first time, in high school, was grades. And then once I got to (NE Oklahoma A&M) junior college I fixed that, and I got overlooked by the D-Is because I went to junior college. Then once I went to Southern Illinois, I got overlooked because I guess I, you know, played at a lower level. I haven’t played with the big boys yet. Tell me about your performance at the Texas vs. The Nation game. What was that week like, and how do you think you did? Oh, it was a fun week. I learned a lot. I learned a lot about what the running back has to do: the blocking, the routes you run. I felt like I performed very well. The game was a lot of fun. I could tell that the speed was a little faster than what I’m used to, but I still felt like I ran well. It was fun. Do you think coming out of Texas has helped you throughout your career? It’s such a football-minded state. Do you think that was beneficial? I came out of Oklahoma. Oh, I’m sorry. That’s my second mess-up today! So, okay, coming from that area, and – didn’t you play for Texas in the Texas vs. The Nation Game? Yeah, I don’t know how that worked. (Laughs.) Yeah, they did! (Laughs.) I just played for whatever team they told me to. So how do you think that pedigree helps, coming from a part of the country where football is so important? I think it helps a lot. Where I came from, I played football with (Oklahoma QB) Sam Bradford. We both played on the same team (Putnam City North) and we all had big dreams as young kids and we were destined to live our dreams, do whatever it took to get them. Now I’m just that close to getting it. Because of your size – you’re about 5-9, is that correct? You’re probably projected as a third-down back, a specialty back. Do you think that’s fair, and what do you think you could bring to a team? I guess that’s fair. I mean, I don’t care as long as I can play football at the next level. What I’m looking to bring to a team is just a spark. Third down back? That’s fine with me, as long as I can light a spark on the team or be that man that, you know, helps the team play and gets the team up and ready after one play. Now, you’ve returned kicks, too, is that right? That’s something that most of our readers have probably never done, and we watch it all the time. What advice would you give someone who was returning a kick? Um, don’t drop it? (Laughs.) That’s the most important thing I try to focus on, just to catch it going forward and go. I think you caught 17 passes this year? Do you see yourself as a pass-catching back, or is that something you think you might need to work on? Oh, yeah, I feel like I can catch the ball out of the backfield very well. It was just – it was an offense that didn’t allow us to do that, that didn’t allow running backs to do it. But I feel like I do well catching the ball out of the backfield. What do you think is your strongest point as a running back? Probably my speed, my vision, and power. Speaking of those things, what are you doing in terms of working out these days? Right now, I’m working out with Mike Gough at Athletic Edge down there in Sarasota, Florida. We’re doing a lot of speed work, a lot of lifting weights and working on 40s. We’re doing everything possible for what we’ll do at the combine-slash-pro day. Have you been timed recently? Do you know around where those times might be for you? Yes, sir. A 4.4 flat (in the 40). I’ve been timed at 4.4 flat. That’s pretty good. That’s better than the one you had at the beginning of last year, is that right? And how about your shuttle runs and things like that? Do you have any times for that, or that’s just something you’re working on day-to-day? Oh, I’m still working on it. I mean, I’m close to a – I want to say I’m averaging around 4.1 (in the 20-yard shuttle)? But I still have a lot of work to do on that. As a smaller back, are there certain backs that you look at in the NFL, guys you might look up to? You know I’m a small back, but I like to watch Adrian Peterson run. But, small backs, I guess if Reggie Bush is a small back. I love what he did in the playoffs, because he’s learning how to run the ball – like, he ran it (well) in college, but he’s learning how to run it better now. So I’m watching him. Is that something you try to emulate, or do you think naturally that’s kind of the way you want to run the ball? Because it seems like there are times when you know how to run between the tackles. Oh, no, I was just saying I like to watch him. No, I don’t want to emulate Reggie at all. Really, I just run the ball, I don’t know who I try to run it like. I like watching Adrian Peterson. If I had size and power, I’d try to run the way he does. I just like watching him run the ball. Did you talk to any scouts during Texas vs. The Nation week? Yes, sir, I talked to a bunch of them. I talked to the Colts, the Atlanta Falcons, the Jaguars, the Bears, the Chiefs, Seahawks. Did the Patriots talk to you? No, I did not see the Patriots. Have you gotten to watch them at all recently? What do you think about their offense? I think the offense is one of the best in the National Football League. Tom Brady’s able to throw the ball whenever he wants, and it’s just an effective offense to watch. Even though they lost to the Ravens. They’re still fun to watch, though. Do you think there’s any particular aspect of your game that you need to work on before you make it to the next level? Yes, the technique on my blocking. I need to learn better technique in blocking. I’ll put all the effort in to block, I just don’t have the right technique. Have you been able to work on that down in Florida? Yes, a little bit with Mike Gough. Well, Deji, I really appreciate your time today, and I wish you a lot of luck over the next couple of months. All right, thank you. I appreciate that. Karim was selected by the Jacksonville Jaguars in the sixth round (180 overall).